The AB105LDA combines a compact high output 112dB(A) alarm sounder with a powerful multi-function L.E.D. beacon. 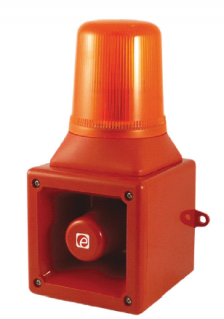 The AL105N features the 112dB(A) A105N alarm horn sounder combined with the L101X Xenon strobe beacon. The compact, robust housing is ideal for all general signalling applications including fire, security and process control. – Sound output: 112dB @ 1m. – 32 tones including ISO tones compliant with Australian Standards (see tone list in attached pdf). – Sounder and beacon controlled independently. – Light Output: Xenon = 200cd(e); LDA LED = 19cd(e). – Flash: Xenon = 60fpm; LDA LED = 9 flash patterns. – Flash Energy: 5J (xenon version). – Volume control, (105dB max – 96dB min on tone 2). – IP66 (IP65 on AB105LDA) protection degree. – Lens color available in: Amber, Blue, Clear, Green, Red. ESS2010N A105 sounder, 10-30VDC, 25mA @ 24VDC. ESS2012N A105 sounder, 24VAC +/- 10%, 40mA. ESS2015N A105N sounder, 35-60VDC, 50mA @ 48VDC. ESS2020N A105N sounder, 115VAC +/- 10%, 20mA. ESS2030N A105N sounder, 230VAC +/- 10%, 15mA. ESS2105N AL105N xenon sounder-beacon, 10-14VDC, 25mA sounder, 500mA beacon, (specify color). ESS2110N AL105N xenon sounder-beacon, 20-28VDC, 25mA sounder, 250mA beacon. ESS2112N AL105N xenon sounder-beacon, 24VAC +/- 10%, 40mA sounder, 300mA beacon, (specify color). ESS2115N AL105N xenon sounder-beacon, 42-54VDC, 50mA sounder, 175mA beacon, (specify color). ESS2120N AL105N xenon sounder-beacon, 115VAC +/- 10%, 20mA sounder, 70mA beacon, (specify color). ESS2130N AL105N xenon sounder-beacon, 230VAC +/- 10%, 15mA sounder, 35mA beacon, (specify color). 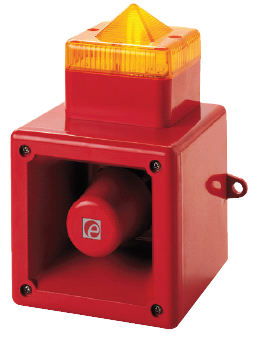 ESSAB2110L AB105LDA LED sounder-beacon, 10-30VDC, 25mA @ 24VDC sounder, 130mA @ 24VDC beacon, (specify color). ESSAB2115L AB105LDA LED sounder-beacon, 35-60VDC, 50mA @ 48VDC sounder, 90mA @ 48VDC beacon, (specify color). ESSAB2120L AB105LDA LED sounder-beacon, 115VAC +/- 10%, 20mA sounder, 90mA beacon, (specify color). ESSAB2130L AB105LDA LED sounder-beacon, 230VAC +/- 10%, 15mA sounder, 50mA beacon, (specify color).